Fitzroy has taken top of the Premier C ladder from Williamstown CYMS on the back of a near-perfect opening quarter last Saturday, which proved too damaging to overcome. Having studied the fast starts of their previously undefeated opponent, Fitzroy came out firing and barely took the foot off the accelerator until the quarter time siren sounded. By then the damage was done and the top of the table blockbuster lacked the tension the neutral fans might have liked. Fitzroy fans, however, were eating burgers, singing the song, congratulating one another and pinching themselves at the beautiful, free-flowing footy that had the home side well out in front. Those who rocked up to BSO half way through the first quarter were as stunned as the Fitzroy and Williamstown entourages and perhaps somewhat disappointed that they didn’t see a tighter contest. Whilst the attacking footy was great to watch, the game plan was built on the back of ferocious defence and the Roy Boys certainly did bring out their best footy when it counted. When Williamstown did have the ball, they were not given any room to move. Every line did it’s job but it was the miserly defenders who were lauded by the coaches at the end of the day, with everyone’s favourite prodigal son Toby Hudson-Bevege wining the Royal Derby voucher for best on ground. Max Ellis was runner up and Bill Clayton took the one percenter award. Max may have been doing his job down back but he’s also suddenly got a taste for the goal kicking business, and snuck down field and side-stepped his opponent for an outstanding long range goal. Nino Lazzaro must have narrowly missed out on the votes with a game which was as good on the ground as in the air. Nathan Jumeau continued the form of the Marcellin game and kicked three goals, including a nice one for the highlight real with a few running bounces, with Bernie Wright also accurate for three goals. Aidan Lambert was not to be outdone with two of his own. All of Fitzroy will be in mourning when Lambo and Max Davies get on that plane for Russia in a few weeks for the World Cup and sightseeing. Hurry back! Perhaps there was even greater merit in the win, given the mid-week injury to star midfielder Rory Angiolella and the late withdrawal of Noah Wright and Jack Dalton. 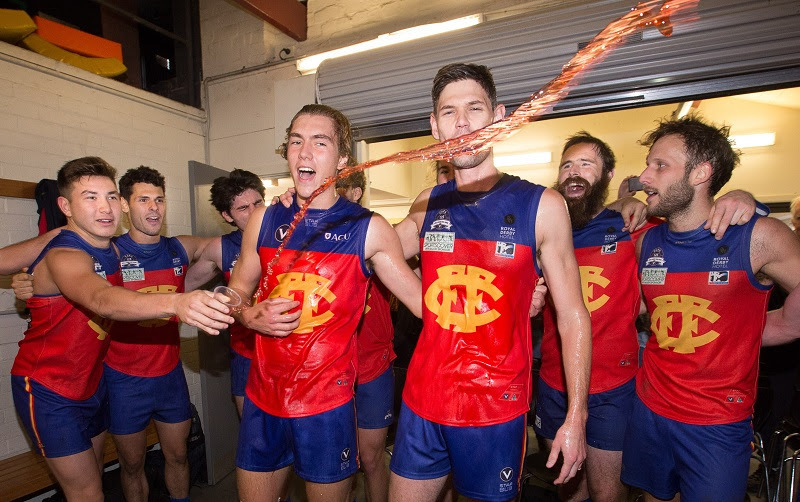 Altogether there were four changes to the previous week’s side with ruckman Andrew Pettigrove (47) and TAC Cup player with the Northern Knights, Jack Hart (14), both coming into the team for their first senior games for Fitzroy (they feature in the picture of the Gatorade shower above). They were joined by the hard-nosed Jimmy Butler and Gus Richardson. It was a seamless transition really, with Pettigrove doing a great job around the ground and also named in the best players. It’s a testament to the whole-club approach to the game plan. Every player played their role and all attacked the contest with relish, typified by some outstanding tackling by Sam Baker. If there was a criticism it was that the home side perhaps eased up in the last quarter. All credit to Williamstown who stayed level with Fitzroy for the remaining three quarters and the final margin of 45 points was only three greater than the margin at quarter time. The final score was 15.13.103 to 8.10.58. For an excellent summary of Fitzroy’s wining weekend, all the results, and the highlights of the men’s and women’s senior games, new sponsor, Risk Care Financial Services, has put together the first up of its weekend round-ups. And you can see it down below. The video will appear on Facebook each week. There was plenty of love and media coverage for the winners, with the Local Footy in the Leader/Herald Sun running a story about our ‘massive statement’ and the VAFA writing about the Kings of Premier C. Meanwhile the King himself (George that is) was moved to poetry in the Footy Almanac!! Check it out with a special mention to the Tram Conductors’ BOG, Nino Lazzaro. This weekend’s game is against PEGS, coached by last year’s Divisions Section VAFA Coach of the Year, Dane Pound, who has the Bombers sitting nicely in fourth position in their first year in Premier C. Coming off a premiership, they have kept their strong form and as a good mate of our senior coach, Luke Mahoney, Pound will have his charges primed for a shot at knocking off the top team. We’ll need to be fast out of the blocks again. 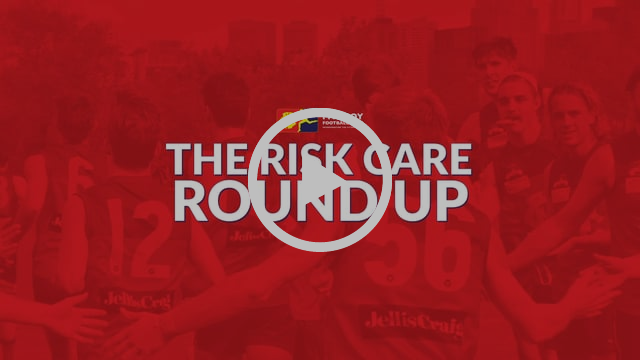 The new Risk Care Round Up of Fitzroy's games over the weekend. Nice work by Matt Kyroussis and the team at Risk Care Financial Services. Meanwhile arguably our best performed team for the year the Men’s Reserves side, continued on their merry way at the top of the Premier C Reserves ladder. Their victory over Williamstown came on the back of a strong start and a four-quarter performance, having learnt from the previous two outings where they have had some slow patches and let teams back into games. But for inaccurate goal kicking, the margin would have been greater than the 11.15.81 to 6.9.45 win. Lachie Henderson continued his excellent form and kicked three goals, Will Zahgis and Sean Laidlaw (pictured) kicked two. Mitch Bottomley and Jack Atkinson were the stand-out players of the game. Congratulations to Sean Laidlaw who played his 50th Fitzroy game last week and to Eddie Harley who will play his tomorrow. If PEGS win tomorrow, they may go into fourth spot on the ladder, so they have plenty on the line. Please note for players, supporters and volunteers of the all-conquering Ressies side, this week’s game against PEGS has been moved to the school; Penleigh Essendon Grammar School, on the corner of Keilor and Rachelle Roads, Keilor East (entry from Rachelle Road). The Reserves will be starting at the special time of 1pm. The Seniors will be starting at 2pm as usual and will be playing at the PEGS Sports Field, 127 Wright Road, Keilor Park. 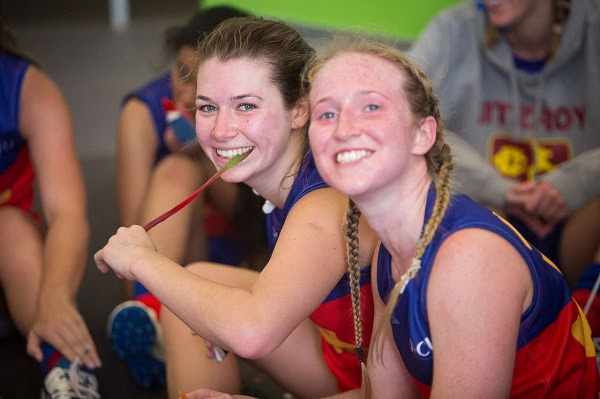 Congratulations to two of the Roy Girls’ original 2015 side who will reach the 50 Fitzroy-game milestone tomorrow, when the team takes on Old Xavs at Ramsden Street. 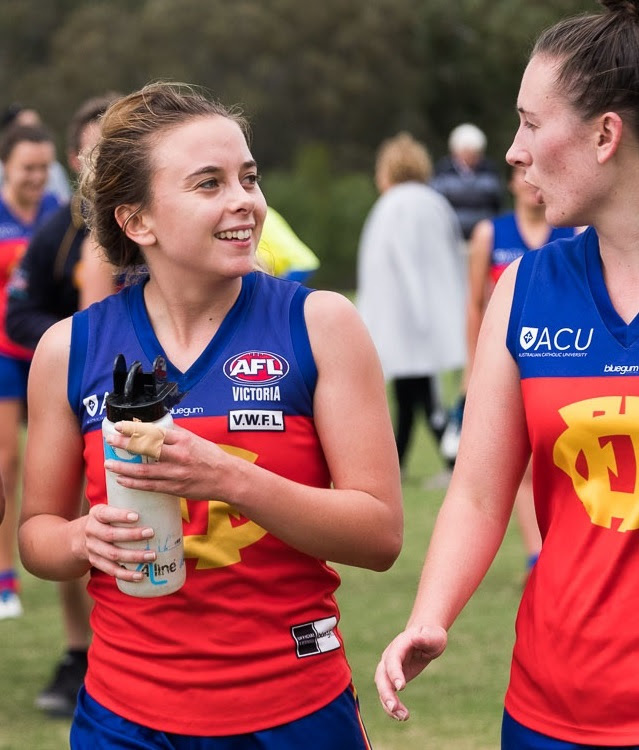 Captain and fierce mid-fielder Gemma Minuz, and towering full forward Liz Olney, have not only been fabulous on-field representatives of Fitzroy-ACU but you couldn’t ask more from them off field. And in the traditional Fitzroy way, their families are right on board too. “Gemma is a tough on-baller who belies her size with her tremendous tacking ability. She reads the play well and will frequently gain clearances from stoppages bringing teammates into the game with her accurate kicking. “Gemma has a great standing amongst her teammates which contributed to her being appointed captain last year and once more in 2018. She is recognised as someone who sticks fast during tough times and will always be encouraging and leading her players form the front,” Mick said. “Gemma also has plenty of fans outside the club, particularly Nick Armistead from the VAFA media team”, Mick said, referring to the recent reference to his captain as ‘the beautiful Gemma Minuz’ on the VAFA Podcast. An off field star in the making, Gemma was the first VAFA female player to appear on VAFA Tragics last year and she was also one of the panellists alongside Kaitlyn Ashmore and Angela Pippos at our Women’s Football lunch in 2017, wowing the experienced journalist and broadcaster, Pippos, with her smarts, humour and relaxed style. Liz Olney is also one of the foundation Roygirls who started with Fitzroy in 2015. 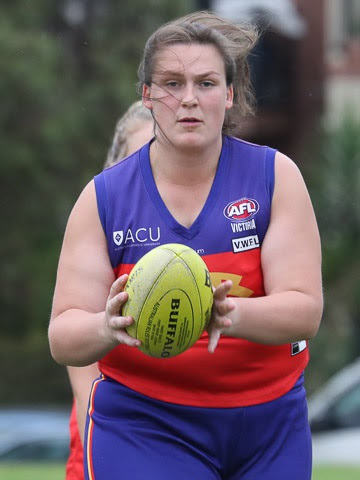 After playing in a few different positions, Liz settled into a spearhead role at full-forward and has become a regular goal kicker for Fitzroy – she’s kicked 44 goals in her 49 games so far. “Liz’s stand out game was against Melbourne University in 2016 when she kicked 7 goals at Victoria Park – a memorable occasion,” Mick said. Best of luck tomorrow to two of our brightest stars. On the eve of her 50th game, Liz Olney, told the story of how she’s roped more than one family member into a voluntary role at Fitzroy. “When Joan put the call out last year to the Women's team to find people to knit beanies, I knew the perfect person - my Grandma Joy. Ever since I can remember, she has been knitting one thing or another - blankets for us as babies, clothes for our dolls, jumpers and scarves for the Guardian Angel Knitting Program - the list goes on. 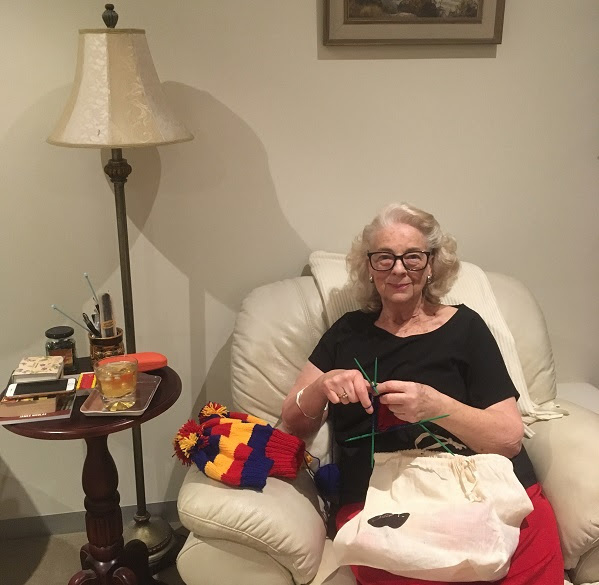 “Since she retired as a solicitor she has been busy with U3A Kooyong, bridge, book club, and spending time with her friends and family, but I thought it was my duty as her doting granddaughter to find something extra for her to do. What started as an innocent question about helping our club has turned into a production line of red, blue and yellow beanies of all sizes! “With Murder She Wrote on repeat, a glass of Johnny Walker by her side and her trusty knitting needles, Grandma has embraced the challenge. Big stripes or little stripes? Red closest to the face or blue? Small single colour PomPom or large tricolour Pompom? These were the questions that were asked. With no template or set design in mind, a bag of red, yellow and blue balls of wool soon becomes a bag of unique, one of a kind Fitzroy beanies. Each time I visit a new bag of beanies is ready to be picked up. “Her dedication to the task is all the more impressive because she is a lifelong Carlton barracker (boo). I asked her why she keeps making the beanies and she had one simple answer - 'because you asked me to'. I like to think she embodies the community spirit of footy, using her talents to help our club and knowing her beanies will be worn by passionate supporters cheering the team they love. I hope she keeps knitting them for many years to come. Thank you Grandma Joy!" And from all of us at Fitzroy, thank you Grandma Joy and we hope your Liz kicks a bag for her 50th game tomorrow. 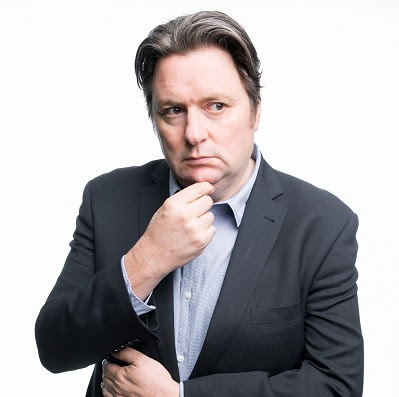 One of Melbourne's favourite comediens Dave O'Neil is heading to Brunswick Street for the Fitzroy Rotary Pre-game Lunch on Saturday 2 June. 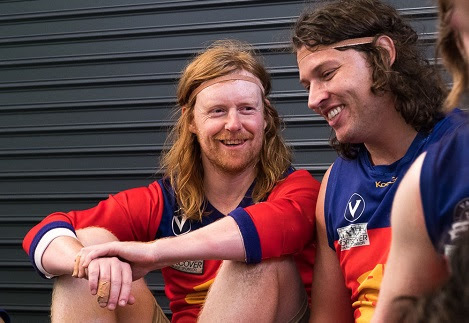 The Clifton Hill local, who turns his hand to acting, guitar, writing and radio, is bound to have the lunch crowd in stitches before Fitzroy takes on Old Camberwell Grammarians. Bookings are open now and you have until Wednesday 30 May... don't delay! 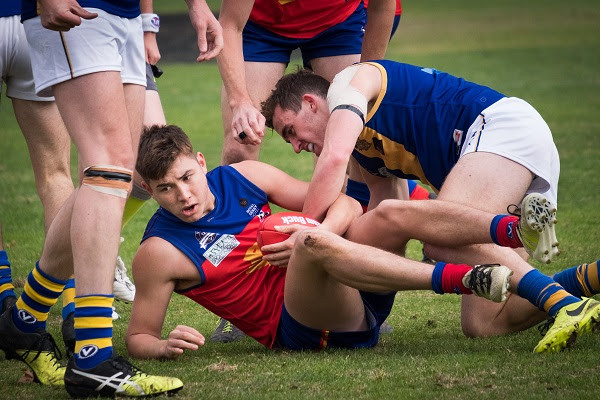 It was a very happy Fitzroy Under 19 side which registered its first win of the season on the back of a five-goal haul and best on ground performance from Rory Patterson. John Jorgenson was strong in front of goal too, with three goals, while Tom Sullivan, Liam O’Connor and captain Riley Harry-Blackall all were amongst the coach’s votes. The Roy Boys got home 10.9.69 to 8.8.56 against their more fancied opponents, St Bede’s Mentone Tigers and tomorrow’s game is also a winnable contest. They have the early start tomorrow with a home game against Old Melburnians at Ramsden Street Oval at 9.40am. Show your support and get behind the future stars of Fitzroy. 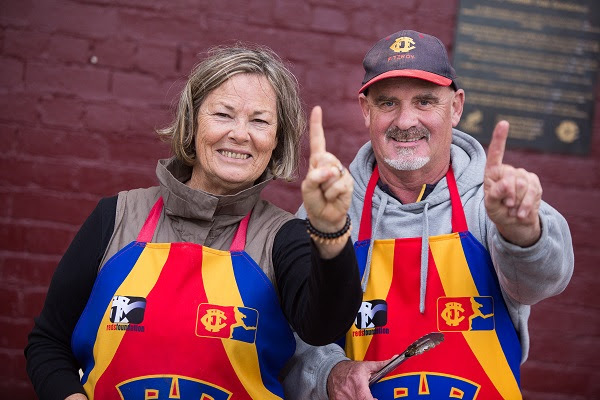 Join the first lady of football for a very special pre-game lunch on Saturday 16 June, before Fitzroy takes on St Mary’s Salesian in this year's FitzroyIT game. Dr Susan Alberti AC, will head to Brunswick Street Oval to tell her story with a particular emphasis on the meteoric growth of women's football. 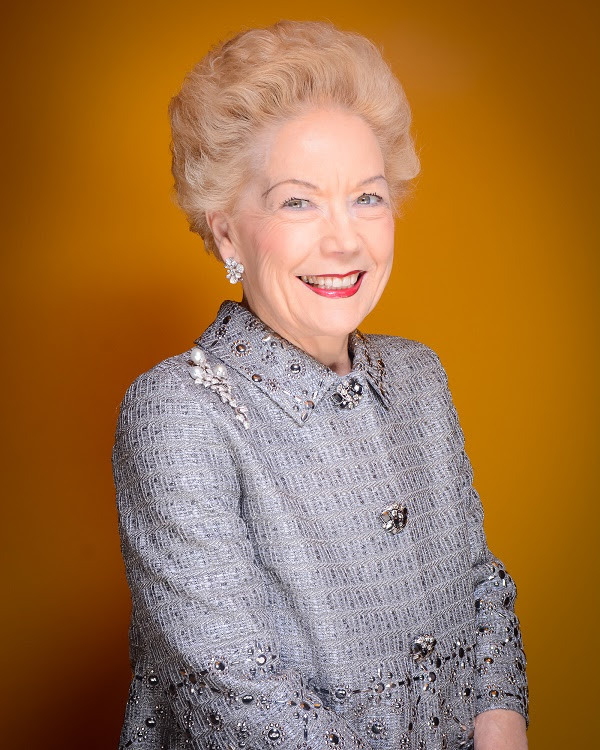 Author of a new book, The Footy Lady, her extensive involvement in football – as former Vice President of the Western Bulldogs and Director of the AFL National Women’s League Advisory Group – is just one part of Susan Alberti's fascinating personal story. Susan is one of Australia’s pre-eminent philanthropists, having donated millions of dollars to medical research and other charitable causes over her successful business career. As well as launching her book, 2017 saw Susan crowned Melburnian of the Year and presented with a leadership award at the AIS Sport Performance Awards for her vision and influence in driving the launch of the inaugural AFL Women’s competition. Many of us know the highlights of Susan't fascinating story, but you won't beat hearing it in her own words. She will bring a strong focus on women's football and the current state of play with the AFLW too. Susan will have copies of her new book, The Footy Lady available for purchase and autographs. This lunch will sell out fast so don't delay! (Ticket price $45). It might have been a while between wins, but you’d never know it with the attitude of the Fitzroy-ACU Reserves side. This week the smiles were even wider as they knocked off St Kevin’s Saints at Ramsden Street in a hard fought and close contest. Coming from behind and keeping St Kevin’s goalless in the final quarter, Fitzroy-ACU won 3.6.24 to 3.2.20 with Bridie Murphy kicking two goals and Calypso Poole, one. Susie Worthington and Nikita Smith were the best players for the Roy Girls. 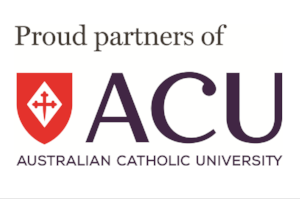 The win puts Fitzroy-ACU into the four, just ahead of St Kevin’s. Despite a good start to the day, it wasn’t quite the result the Senior side was looking for in the second game against St Kevin’s. Last year’s close rivals were far too strong and defeated Fitzroy 10.12.72 to 3.2.20. Collingwood VFLW-listed Sarah King was outstanding and in a great solo performance, Ruby McDermott kicked all three goals. This will be one the Roy Girls will want to move on from quickly and focus their attention on Old Xaverians tomorrow in a game they really need to win to stay in touch with the top four. There is nothing the Fitzroy Thirds love more than a home game at Brunswick Street Oval and tomorrow is one of those rare days when they have access to the big deck. Coming off two wins, the team will be pushing for three in a row when they meet Monash Blues at 11.40am. So if you cannot get out to East Keilor there will be plenty of great football at Brunswick Street tomorrow too. Last week’s thriller against Caufield at Ramsden Street, resulted in a two-point win; 10.10.70 to 10.8.68. Simon Heather kicked four goals up front and no wonder Nathan White is smiling; he was best on ground. It's hard to put into words how much we love our volunteers at Fitzroy. They are the life blood of any community football club. This week is National Volunteer Week and AFL Victoria is encouraging the wider football community to thank their dedicated volunteers for their service to football and invaluable contribution to our great game. They interviewed some of our favourite volunteers for this beautiful story on the AFL Victoria website. 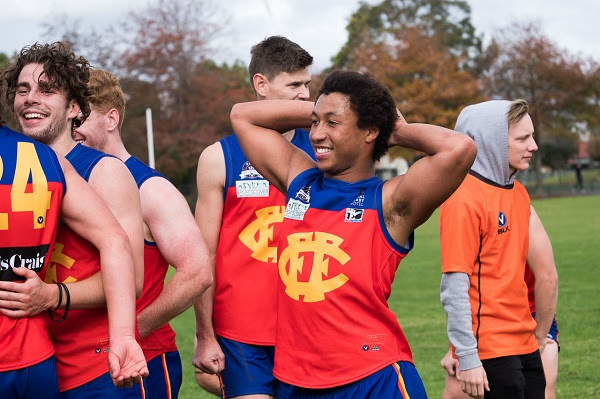 After riding past the Fitzroy Football Club on a tram in 2011, David Barnes’ decision to hop off and check out the club is one he will always be thankful for. Anna Pavlou reports. Seeing the team train at Brunswick Oval for the first time, David’s passion for football and his beloved club has grown since that day. Please go out of your way to say thank you to the volunteers around the club this weekend. We wouldn’t get too far without them. Thank you to each and every one. If you have a passion to get involved, we have lots of opportunities; please contact Director Volunteers, Gabrielle Murphy or let us know here. If you’re a fan of women’s football, our friends at the Fitzroy Victoria Bowling and Sports Club and the Footy Almanac are combining forces for a Women’s Footy Almanac Pie Night on Wednesday 30 May. The event will feature a panel on the writing and media coverage of the women’s game from AFLW’s inception to what’s happening in the current VFLW season and wider issues in the landscape of women’s sports coverage. Guardian sports journalist and writer Kate O’Halloran, writer Kirby Fenwick, Essendon VFLW player Kendra Heil and writer and Uni of Melbourne VFLW player, Lucy Watkin make up the panel, which will be hosted by the Almanac’s Women’s Football editor, Kasey Symons. Tickets will go fast as there are limited spaces so get in early. Book here. Fitzroy Trivia Night a sell out! Thanks to everyone who has booked to attend Fitzroy's trivia night on Saturday at BSO. 100 keen trivia buffs willl be vyikng for the $500 top prize with quiz master Keith Dimech in charge. There are some other great prizes too, including restaurant and movie vouchers and of course some outstanding Fitzroy merchandise.